One of the things that Nords apparently love to say over and over is “Seen any ELVES? ?” And then they burst out cackling like they just said the funniest thing in the world. And I just don’t get it. At all. Like, is it supposed to be a threat? Is it supposed to be funny? What is going on? I don’t think Master Aryon understands what the Nords are going on about, either, but Steen just needed to vent. And I’m sure Aryon has… opinions on Nords. I’ve also just noticed that apparently, in this comic, Mistress Steen and Master Aryon live in the Desert Golfing world. This was unintentional, but this is my headcanon now. Also, I’m going to go do 24 Hour Comics Day tomorrow… and I’m super nervous. I don’t know why I put myself through this every year, but I’m always glad that I do. 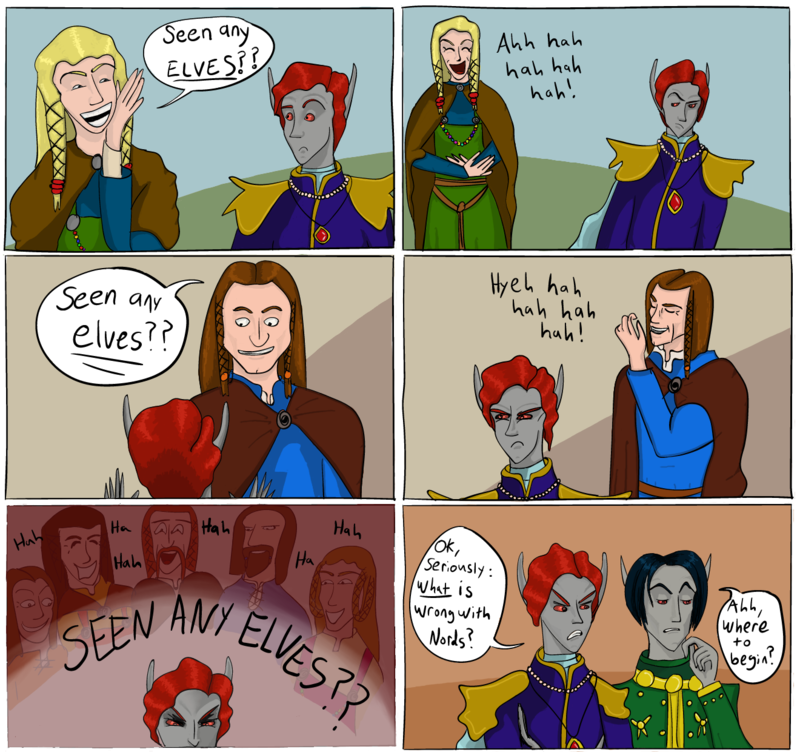 This entry was posted in Art, Doodles, Gaming, Silly, Videogames and tagged comic, Comics, Master Aryon, Morrowind, Nord. Bookmark the permalink. 1 Response to Seen Any Elves?